The Mermaid Café is an altruistic band made up of a trio of sirens: Patty Forman, Jewel Jerstad and Lonni Bryant. Welcome to the Mermaid Lounge. The wooden deck is adorned with signs of beautiful sea nymphs, seashells and candles. The benches built into the structure offer a laid back seat to enjoy stunning views of the harbour. In the fresh air, as the sun slowly melts away, three women sit around a table with a fire dancing in the centre. Two of them hold guitars framing the third woman and together they sing Helplessly Hoping by Crosby, Stills, Nash and Young in sweet harmony. Lonni Bryant is on the guitar and mid-alto vocals, Patty Forman is on the left-handed guitar with soprano vocals and Jewel Jerstad on the egg and singing alto. 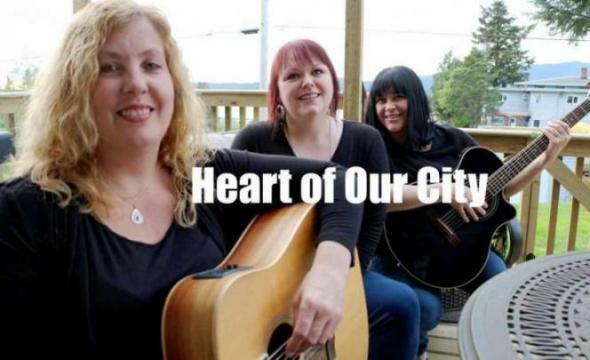 The sirens of The Mermaid Café have played for Prince Rupert audiences and at festivals in B.C.’s north for 11 years. They grew up in Prince Rupert but their paths didn’t align until they joined the musical Leader of the Pack in 1999. At first they joined The Undecideds. “It was a 13 or 14 piece band depending on the day. A very large rhythm and blues band,” Bryant said. “It was really well known in the area,” Jerstad said chiming in. “We’ve played at festivals and stuff like that in Smithers. It still kind of lives on but we regurgitate once a month. We played lots 15 years ago,” Forman said with her husky voice. They unpack their story one by one, piece by piece. The ladies were the three part harmony back up singers with The Undecideds. “Then we branched and started learning to play a bit of our own songs so the boys couldn’t tell us what to do any more,” Forman said, with Bryant adding that they just picked up the guitars and played for themselves. Forman played the piano but struggled with the guitar growing up — there weren’t too many left-handed guitars on hand. When she ordered one, she “hacked away at it and YouTubed it” to learn how to play the songs she was into. Bryant played guitar since she was 15 but took a lengthy hiatus from the craft. She had to fine tune her skills to get the band going. The ladies mostly play for charity or events in the region. They have played for events including Seafest, the Ride to Conquer Cancer fundraiser and they have gone to Acropolis Manor on seniors’ pub night where Forman’s parents stayed. The musicians expressed mirth at a memory one night when an older gentleman decided to get super close to Forman while she played. “He was dancing and clapping off time right in front of her face and we were trying to hold it together the whole time,” Jerstad said. The mermaids have developed a keen sense of community over the years and they see their music as a way to give back. “I love playing music and this community is quite special in that way where it just doesn’t seem to be a burden. It’s something that you just do. Someone needs help, we’ll go play a gig. Wildlife Shelter, SPCA, you just go and you do it,” Bryant said. They also played at Jerstad’s wedding in 2008, and more recently for Forman’s mom’s celebration of life. At festivals, the mermaids bring along their “Crusty Crabs” to boost their sound for bigger gigs. Bryant’s husband, Ian Lihou, plays bass and either Ross Barbutt or Gorden Olsen join on drums. Forman said it’s better to have the whole band sound when plugged into a PA system. The mermaids and crabs have played on the main stage at Kispiox Valley Music Festival. Leading up to their set, the crowd had thinned out to take cover from the rain. But then, the sun came out and everyone enjoyed the show. The biggest crowd they’ve played for was at the Torch Relay for the 2010 Olympics, where the torch was lit and passed throughout towns in B.C. The Olympic committee brought its own performers and a travelling setup as part of the show and local talent was invited to fill in. More recently, residents might have spotted the ladies at the “Rock of Ages” musical at the Lester Centre of the Arts. Forman got a perm, Jerstad cut her hair like Joan Jett and wore a banana clip and Bryant donned a voluminous black diva wig. “It’s only been recently that we haven’t been a trio (in theatre performances) but we’ve always been stuck together because we blend well. In “Little Shop of Horrors” we were the street urchins, the three girls who sang back up everywhere,” Bryant said. Coming up on June 11, the mermaids will be in the “Completely Plugged – Made In Canada” concert at the Lester Centre. It’s another charity event to raise money for the arts centre to replace worn out gear and equipment. Over the years, The Mermaid Café have cherished performing as a theatre trio, playing outside around the campfire or jamming out on the Mermaid Lounge after work finding that sweet spot where their voices align — a hypnotizing sound that could lure sailors in from afar.